For the finest in Northern Punjabi Cuisine, look no further than Golden Gate Indian Cuisine! Since 1997 we have been creating the tastiest North Indian Dishes with the best value for our loyal customers in The City in a clean, comfortable, intimate atmosphere. If you would like to make arrangements for a Private Party or catering for your event, just give us a call and we'll work with you to help make your event a success. Stop by for our delicious Lunch Buffet and enjoy a wide selection of traditional Indian favorites or join us for Dinner and choose from a wide selection of dishes. Don't feel like driving??? Then use our convenient ONLINE ORDERING SYSTEM. It's fun and easy to use, whether you are ordering in or planning your next visit to our restaurant. We deliver the freshest, tastiest Indian food in The City. We use only the best ingredients and make fresh Naan in our Tandoori Oven. Our speedy delivery service assures a great meal every time you order. If you need extra napkins or plates, simply use the comments box on the delivery form when you submit your order. Our delivery is FREE, with a minimum of $15.00 per order. 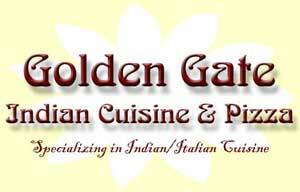 So, whether you live here in San Francisco or are planning to visit- Give Golden Gate Indian Cuisine a try. You'll be glad you did. Dine in, take out or delivery- we're ready to bring San Francisco's finest to your table.